Explore the traditional mosaic glass of Venice known as smalti, using traditional and modern tools to begin a small mosaic. This richly textured, opaque glass has been used for centuries and adapted by craftsmen in Italy and Mexico. You'll have the opportunity to use the traditional hammer and hardie to shape the glass for the start of an 8\" square project to finish at home with provided materials. No grouting needed. Learn about traditional and contemporary methods of application and cutting smalti and the advantages of each type of smalti as you work in the direct method. 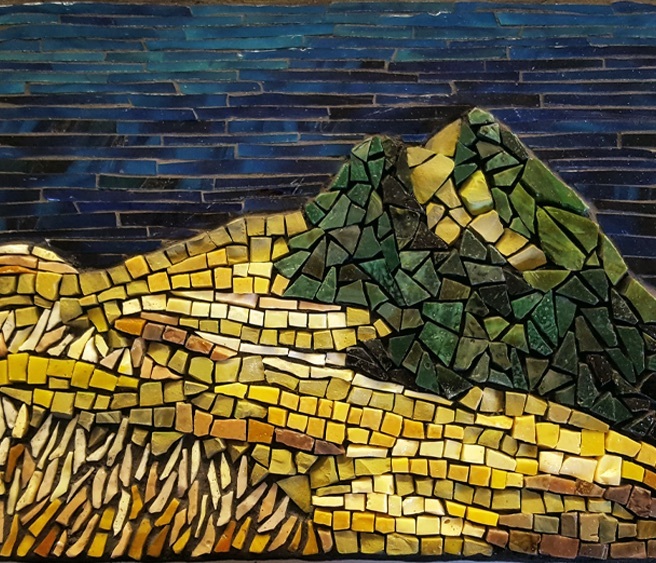 Joanne Daschel creates mosaics with glass and stone in her studio at the Lincoln City Cultural Center, combining traditional mosaic tools and materials with contemporary design and techniques. She teaches from her studio and Artists' Studio Association in Lincoln City and shows her work at Volta Gallery in Lincoln City. be ordered from smalti.com, mosaicsmalti.com or dimosaico.com, or from instructor ($25). Optional - bring a simple design for an 8\" square substrate. Instructor will provide other design templates if you don't have one. • Fee includes 2lbs. of smalti for your project, additional may be purchased separately.